The world’s oceans are getting busier. They are being inundated with oil and gas exploration projects, installation of underwater energy and communications cables, pipelines, windmill installations, increased fishing fleets and power generating turbines. And all of this and more generates a greater need to protect the marine life habitat, help better understand the oceans and their bottoms and accentuates a requirement for solid, sustainable conservation measures. The science of bathymetry, or seafloor mapping, is one of the tools used to help determine areas for safe underwater exploration and equipment placement plus vital to protect and track marine life. With a goal of finding better ways to map the sea floor in mind, Brown and the NSCC’s oceans technology branch, are teaming with Quality Positioning Services BV (QPS Canada Inc.) to do just that in a six-month project. Oceans technology is one of five divisions of applied research at the college, which has a mandate to serve industries in the province and support them in terms of training highly qualified people for workforce and applied research. It also addresses novel needs and innovation and works with industry to improve business practices. QPS, with an office in Fredericton, New Brunswick, is headquartered in Zeist, The Netherlands. An independent software design company, QPS is focused on system integration of survey sensors and the development of software applications used for hydrographic surveys, sea-floor mapping, portable pilot units and Electronic Navigation Charts (ENC) production. Brown said multi-beam echo sounder mapping technology is the focus of the collaborative research. “This project is focusing specifically on backscatter which is a signal that comes back from a multi-beam system looking at the reflectivity of the signal from the sea floor. Traditionally, multi-beam systems kind of came about for bathymetric systems,” he said. He explained that multi-beam systems occurred in the very late 70s and early 80s and in 90s became more mainstream. “Pioneering work was done through a few key research institutes. Bedford Institute of Oceanography (BIO in Halifax) being one of them. The Canadian Hydrographic Service did a lot of work with early multi-beam systems plus there were groups in the U.S. and France as well,” he said. In the late 90s multi-beam systems became more sophisticated in the detail they reflected with the use of a number of echo sounders measuring the returns from multiple beams in a swath rather than just getting a single measurement from beneath the vessel, Brown said. Covering more of the seafloor in one pass was attractive for hydrographic chart production “so a lot of the hydrographic offices around the world recognized you could create much better nautical charts,” he said. And by getting continuous coverage sweeping the sea floor, “you don’t miss any shallow spots and for safety navigation that is paramount,” Brown said, adding, it also a way to see the sea floor in 3D. However, the international scientific community continues to examine how sea floor reflectivity data or backscatter collected by these systems is measured and processed. “Using passive sonar reflective technologies, we will work with QPS to investigate ways to calibrate sea floor scatter data sets in the field. This is the first stage to developing post-processing software tools for the correction and mosaicking of multi-beam backscatter data sets. We believe results from this research will offer benefits to a wide cross-section of end users looking for improvements in the quality of backscatter data sets for the production of better sea floor maps,” Brown said. Dr. Jonathan Beaudoin, with QPS, said his company will work with NSCC and produce the mapping software from data collected during the project. Beaudoin said plans are to use a calibration target called sonarbells developed by Subsea Asset Location Technologies Inc. in the UK. “If you ping at it, it gives you a certain type of tone back that you can identify and this particular device is good for finding things on the sea floor,” he said. “We are looking at using the echo strength not just to tell how deep the water is but how strong the echo is and that is an indicator of what the sea floor might be, rock or mud or sand. A map of that reflection strength tells you something about the sea floor more than just the depth alone,” he said. 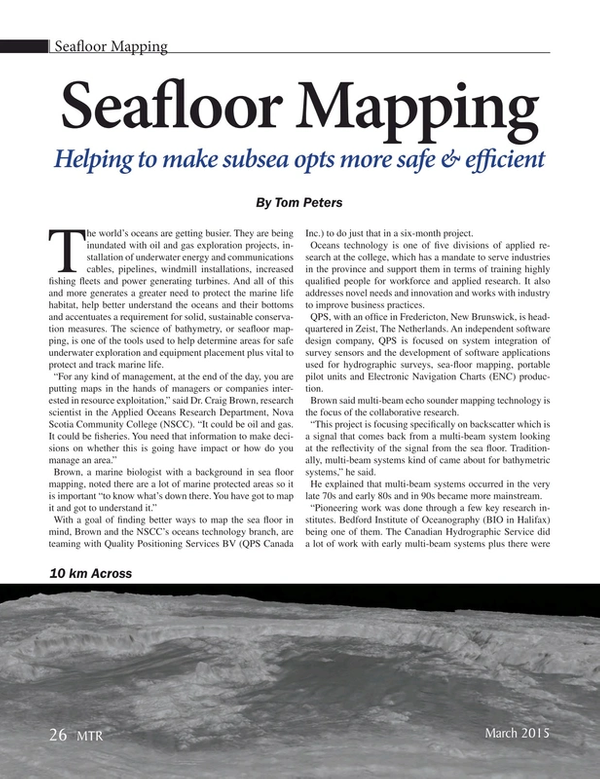 Several industries working in the oceans rely heavily on accurate sea floor maps. Fundy Ocean Research Center for Energy (FORCE) realizes the importance of sea floor mapping and will continue to rely on it as it pushes for with harnessing energy from the powerful tides of the Bay of Fundy between Nova Scotia and New Brunswick. “Mapping the sea floor has been critical to every decision we’ve made: where to lay power cables, where to locate turbines, how to operate safely, and where we can expect the most powerful currents. As the industry expands from single turbines into arrays, mapping will guide our way forward,” said Tony Wright, FORCE general manager. Clearwater Seafoods, a major international seafood company in Halifax, NS, has been using sea floor mapping to find marine habitat and create a more efficient and environmentally friendly fishery. Catherine Boyd, Clearwater’s manager, sustainability and public affairs, said Clearwater, like many fishing companies, has been using multi-beam mapping for several years. “We were certainly one of the proponents advocating for it,” she said. An initiative started in the late 90s helped improve the harvesting of scallops. She said 3D images of the ocean bottom were overlaid with habitat information and baseline geography of the area which created multi-dimensional maps that allowed Clearwater to target the area where it felt was the prawn scallops habitat. “It was an excellent initiative and the environmental benefits were twofold. We shrunk the footprint of the fishery and additionally we were using less fuel to collect the quota. It made harvesting in that fishery more efficient and more environmentally friendly and if better maps are produced we will use that information as well,” she said. Carl Makrides, Director of Resources, Canada-Nova Scotia Offshore Petroleum Board, which regulates all of the oil and gas drilling of wells offshore Nova Scotia, said as part of the authorization process for companies seeking to drill wells, they must submit a full seabed survey or a geo-hazard report that which at times includes multi-beam data. “The precursor too that would be something called 2D seismic data. It tells you a little bit about a very large area while 3D seismic tells you lot about a small area but more concentrated and with high resolution,” he said. However, Brown indicated that the type of data used often depends on the needs of the proponent. “Often the seismic surveys come first to identify the resource, and then more detailed surveys - which more times than not include multi-beam mapping surveys are done at the drill site locations to identify geo-hazards and characterize seafloor geology/environmental characteristics,” he said. The various data sets are used to determine if there is any risk to the drilling operation. Another way the data is used, said Makrides is for exploration purposes. “An oil company looking for hydrocarbons will sometimes identify what they call gas escape or pockmark structure which look like cylinders or cylindrical features on the seafloor. If the quality is good enough those cylindrical features, assuming they are large enough to be imaged, can actually indicate the escape of natural gas or hydrocarbons in the formations,” he said. The data is also used to determine the stability of the sea floor where a drilling rig will be located to ensure nothing in the area will cause problems. “So the data sets gets used on the hazard side and the exploration side depending on quality of the data,” he said.